Brass sign letters are used to create some beautiful signage, but then I am personally fond of the stylish look of brass letters. We offer "flat-cut" brass sign letters which allow you to use a wide variety of typestyles or you can have a custom logo produced from the same material. These brass sign letters are available in several nice finishes (see below for choices). 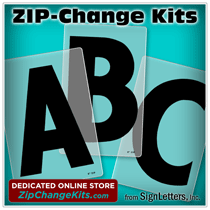 These are the same professional lettering products used by sign shops around the world. When you use quality brass letters, you'll add a special elegance to your sign.